Hours after Bill de Blasio kicked off Internet Week, the technorati poured into Cipriani Wall Street last night to see Patton Oswalt host the 18th annual Webby Awards. The comic was quick to poke fun at websites whose founders were in the audience: “Even if I eat it tonight Reddit will find a way to blame it on the wrong person,” he quipped. Here, now, are the ceremony’s most memorable (or shall we say, Tweetable) moments. Banksy Piece Gets Defaced, Restored, and Then… Framed? 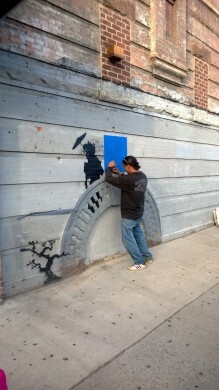 Banksy took to the Williamsburg-Bed Stuy border today for the 17th installment of . Hours after his piece went up on Cook Street, off of Graham Avenue, it was vandalized. But a few art-friendly Good Samaritans did some on-the-spot restoration and — although a smudge is still visible — the mural is pretty much clear. While B+B was on the scene, a man covered the right figure with a square piece of blue Plexiglas. Hysteria ensued as everyone remembered the guy who, a few days ago, tried to charge people $20 to take a picture of a Banksy piece.